Marlins' farmhands ask: Got Eyewash? Jupiter Hammerhead pitcher Jay Buente sports Eyewash gear infront of the Florida Marlins spring training clubhouse. The end of the regular season normally brings minor leaguers a few months of relaxation. That doesn’t apply to Florida farmhands Jay Buente and Jarrett Santos. They’re still attending to business. Last year while at Greensboro, Buente and Santos joined former teammate Avi Rasowsky in the formation of Eyewash – a clothing company which takes its name from a slang baseball players use to describe an article of clothing or an accessory that aids a player’s look more than his performance. Eyewash’s primary items include elbow sleeves, wristbands and dry fit shirts. “We sell athletic apparel that’s basically useless, but it makes you look good,” Buente laughed. Many teammates within the Marlins’ organization received samples during spring training. Some of those samples were exposed to a wider audience when worn by major leaguers during the regular season. Handling computer duties is nothing new for Buente, who had his own Web site long before Myspace took over the teenage world. A Purdue graduate who teammates and coaches often turn to with computer problems, it took Buente less than 12 hours to create the goteyewash.com website after the trio decided to pursue the venture. Buente, 5-1, 3.00 ERA in 60 innings of relief this season, is not willing to swap baseballs for computers and clothing just yet. 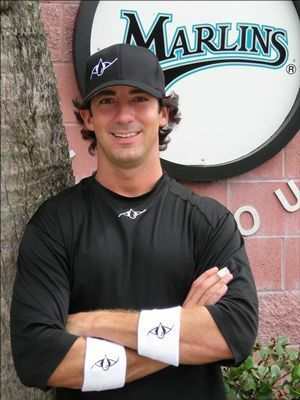 Though his locker at the season’s close was loaded with new Eyewash products, his Jupiter Hammerheads uniform was still the most important item hanging there.